What's the best power rack for you? If you're going to buy a power rack, you'll have to shell out at least $300 (at most $5,000+!) of your hard-earned cash. So you want to choose a rack that matches your needs and budget. I highly recommend you read my power rack buying guide before diving into this page -- The guide will advise on on which features you should look for buying a rack, what to avoid when, and it also gives several specific recommendations for different budget levels. What's the Best Power Rack for the Money? As you'll see when you scroll down, this page contains a comparison chart of mammoth proportions: A truly epic chart that compares the specifications, features and prices of nearly every power rack on the market. 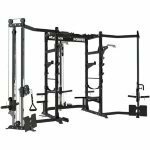 Titan T-3 Power Rack - The T-3 starts at $369 for the short version with free US shipping​. This is my go-to recommendation for anyone who wants the best power rack for the money. The T-3 has the most desirable specs/features for powerlifters and bodybuilders, a lot of accessories available (thanks to the modular design) and commercial quality construction--All of this at half the price you'd expect to pay. Be sure to read my Titan T-3 power rack review to learn all you need to know about this rack. Titan X-3 Flat Foot Power Rack - The X-3 starts at $495 for the short version with free US shipping. This is a step up in robustness and durability from the Titan T-3. It's got tons of accessories available, too. Importantly, it does not need to be bolted to the floor for safe use, unlike the T-3. It's a bit more expensive than the T-3, but still very price competitive. Oh, and did I mention that I own this rack? It's awesome and I wrote all about in my X-3 flat foot power rack review. Force USA MyRack Modular Power Rack - The MyRack is possibly the most unique low-cost power rack in the growing market of modular power racks. It has a few standard features that may seem like minor details, but which add a lot of value and differentiate it from comparable racks. First, it has numbered holes. This eliminates the frustration of trying to put the left and right safeties or j-hooks at the same height. You can also easily make a note in your training log of which height settings you use for different attachments, for exercises where that info is important. Second, it has two bar storage sleeves in the back of the rack. This keeps your setup organized and minimizes the space it takes up, while not in use. Third, it has an extended rear support that both both adds stability and serves as a point to install the optional lat pull down/low row attachment. And speaking of attachments, that is the other great thing about the MyRack: its selection of optional attachments include some very unique but high-impact items, in terms of the number of additional exercises that they make possible. I'm thinking specifically of the cable crossover towers and, as I already mentioned, the lat pull down/low row tower. There are several other attachments, but I don't know of any other racks that have these two attachments. If you get them, then you'll really have a complete home gym experience. Be sure to read my Force USA MyRack review and if you decide it's the best power rack for you, then don't forget to use my Force USA discount code KING5 for 5% off. Titan X-2 Power Rack - Starting at $335 for the short version with free US shipping. With a super-high weight capacity of 3000 lbs, The X-2 is stronger than both the T-3 and X-3. Pretty much nobody "needs" that much capacity, but it's still impressive--Especially considering its frame is made of small 2"x2" steel tubing (compare to 2"x3" or 3"x3"). The trick to the strength is thicker (9 gauge) steel. The X-2 is a overall a small, compact set up, which is how you end up pay so little. The big downside is a lack of accessories available (thus far) to fit the small uprights. Also, it has to be bolted down like the T-3. If you're interested in this pit bull of a power rack, I highly suggest reading my full review of the Titan X-2 power rack. ​Titan Fitne﻿﻿s﻿﻿s - Titan Fitness is easily my top pick for the best-bang-for-your-buck power racks (and squat stands, etc.). No other manufacturer comes close to delivering such high quality for such a low price. They've got several different types and sizes of power racks that are all modular (i.e. designed to easily expand and add accessories to). Plus, they're packed with enough key features to make even the most serious lifter get giddy as a schoolgirl when he sees the price tag. Amazon – Amazon has the biggest selection of racks, and they generally offer the most competitive prices. FringeSport.com – FringeSport's offers high quality at an exceptionally affordable price. Their selection of racks is lean, but it cover all bases. Specifically, they carry one (very awesome) full power rack, a couple wall-mounted or retractable power racks, several squat racks, a "rig" and a couple of squat stands. GetRXd.com - Get Rx'd carries several lines of quality power racks that can take a beating. They are highly versatile pieces of equipment. They're compatible with a wide variety of add-on accessories, which expand the number of exercises you can perform in, on, or outside the rack. You may also want to check Craigslist to see if you can find any good deals locally, on used power racks. Without further ado, see the power rack comparison chart below. It took forever to put this thing together, so I hope you enjoy it! I'm confident it'll help in your quest to find the best power rack for your needs! The power rack comparison table below contains 24 columns of data. That's a lot -- And so, only so many columns can fit into your screen at the same time. You have to scroll horizontally to see all of the columns. If you know what you're looking for, you can find it faster by clicking the column headers to sort the table by category. You can also filter the ​table by using the search function at the top of the table. There are some cells in the table that contain additional information. Hover over or tap the "i" icons to see this additional information - it will appear in little pop-up to annotation bubbles.